Unfortunately it was all hype. Gervais seemed pretty subdued and played it safe. There were a couple of over the top remarks (Jodie Foster was the target of one of them) but for the most part there was no controversy, ir even fun. It’s ironic to think that due to the lack of controversy he probably won’t be invited back to host next year. Although I’d say that Gervais wouldn’t be phased in the slightest. Maybe this was his grand plan after all? Take the money and run Ricky! 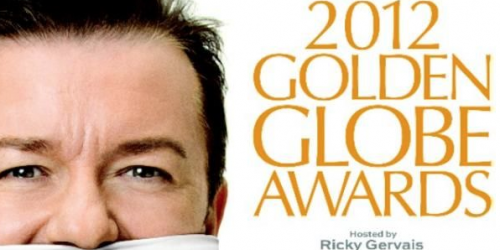 But the Golden Globes weren’t all about Ricky Gervais, they were about the winners. The big winners of the night were The Artist, and The Descendants in the film categories and Homeland and Modern Family in the TV categories. The big surprise of the night was Madonna winning a Stauette for co-writing Masterpiece (a song featured in her new film W./E). This was the weakest song of the lot. I don’t think Sir Elton John was happy. The stand out winner for me was Octavia Spencer. She was genuinely shocked and very happy to win Best Supporting Actress in a Drama (Film), Only last year, she was sitting at home, with her friends, running a pool on who would win the awards. Her speech, where she referenced Martin Luther King was inspiring. This is Dern’s 3rd Golden Globe win in 5 nominations. She was also former Golden Globe Girl. This is Danes’ 3rd win and 3rd nomination. “Mr Poitier, being up here and receiving this award, this tribute that you yourself received, getting it from you, this makes it clear to me that though they know this the Cecil B De Mille award, in my house this will be known as the Sidney Poitier award. “Buenos Noches. Gracias Antonio! Gracias Slama! This being an International Award we are going to accept it in 2 languages!” Sofia Vergara was brilliantly over the top! Fittingly Dujardin ended with a slent, over the top Douglas Fairbanks gesture. Just because the Golden Globes are over, it doesn’t mean award season is. It’s just warming up. Still to come is the Screen Actors’ Guild Awards and it will all culminate with the biggest award of them all, The Academy Award. This entry was posted in Movie News, TV News. Bookmark the permalink.